On Friday it was Daffodil Day. Room 10 had a Fancy Hat Day. Room 10 left the hall to get Daffodil day hats. They did a fashion walk down the middle of the hall. Mr Watson showed us the hat that his wife would of liked. Then Mr Dobbie called out the winners. They were Ryan, Luke and Holly. On Friday it will be daffodil day. People have to bring one or two dollars with a picture they have drawn of a daffodil to enter the draw to win bunches of daffodils. We are having a coin trail as well to raise money for people with cancer. On Monday morning Jared brought his new puppy to school. He is called Cutie. He has curly hair and a curly tail. He sleeps in a cage in the garage. Cutie eats just about everything. Every day after lunch we have a poem monitor. They have to pick some poems. Then they have to read the poems with the class. We use a paint brush for a pointer. Charlie is the first monitor. This morning the builders shifted the PE shed for the two new classes. Everything was taken out of the shed. Some other men arrrived to help lift it. On Friday Mr Baldwin gave out bronze awards to some of the class. 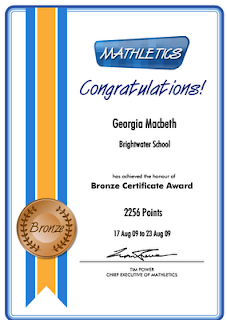 The people that got a bronze award are going to be aiming for a silver award. This morning at Discovery Time Freya, Charlie and Cameron made mousetraps with Marie. Mr Baldwin and Mrs Stewart thought they were yummy. So did the rest of Room 4. We had them for morning tea. Mix all the ingredients together and spread over the bread. Bake at 200 C for 10-15 minutes until the top is golden and puffed up. This recipe is from a Jo Segar recipe book. During the week a lady came to the hall to teach some of the people from Room Four and and other classes Kapa Haka. Her name was Gaynor Rikihana. Heaps of people enjoyed it. She taught us some special Maori songs. She is coming every week. This Morning the builders came to build two new classrooms. First they have to move the P.E. shed. They were making a lots of noise cutting concrete. On Monday Room Four got signed in for Mathletics and made their avatars.We are aiming to get ten or more. Some people can get over twenty or thirty. We were playing against each other this morning. Today we made Apple Crumble at Discovery Time with Cushla. Here is the recipe if you want to make it at home. It is from the Edmonds book. Place stewed fruit in bottom of ovenproof dish. Cut in butter until it resembles coarse breadcrumbs. Stir in sugar and rolled oats. Baker at 190 C for 30 minutes. Today we started making our robots with Mrs Inch. We had lots of fun. Thanks Donna, Viki and Jenny for helping. On Saturday it was Cody's birthday. We had a ride on a fire engine. Cody had a fire engine cake. It was yummy. Cody was turning five. He got a radio and a whistle. I had fun.